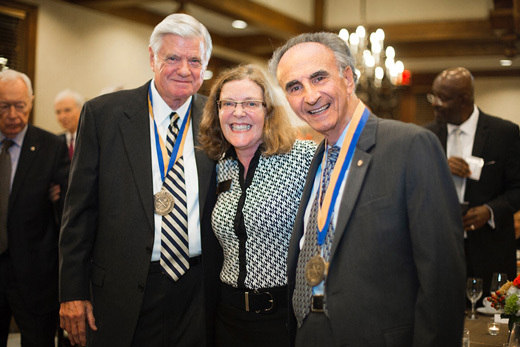 Charles H. “Pete” McTier (left) and S. Perry Brickman, the 2016 recipients of the Emory Medal, pose with Emory President Claire E. Sterk at the Nov. 3 medal ceremony. Two of Emory's most distinguished and dedicated alumni, S. Perry Brickman 53C and Charles H. “Pete” McTier 61B, are the 2016 recipients of the university’s highest alumni honor, the Emory Medal. The honor was presented Nov. 3 during a ceremony at the Miller-Ward Alumni House. For Brickman, the son of first generation Lithuanian immigrants, philanthropy has always been a way of life. “I was raised to work for your community. I didn’t even have to be told,” he explained in his Emory Medal video. A retired oral surgeon, Perry Brickman has a long history of involvement in the Atlanta community. He is a longtime supporter of Emory in the pursuit of Jewish studies through volunteer service and philanthropy. Brickman and his wife, Shirley, work with graduate faculty in the Jewish Studies Program, and established the Brickman/Levin Award to support doctoral students in Emory’s Laney Graduate School. In addition, the Brickmans have pledged their support to numerous faculty endeavors, including the endowment for the Holocaust Denial on Trial website. In 2012 Brickman organized the production of a documentary film, “From Silence to Recognition: Confronting Discrimination in Emory’s Dental School History,” which brought to light discrimination faced by Jewish dental students between 1948 and 1961. For his work, he was given a Maker of History award by the university. During his career, Brickman also served as a dental officer for two years in the U.S. Air Force and practiced oral surgery in the Atlanta area from 1961-2004. He was a founding member and past president of the Georgia Society of Oral Surgeons, and was appointed by then-Gov. Zell Miller to the Georgia Board of Dental Examiners, on which he served for seven years. He is an Honorable Fellow of the Georgia Dental Association. McTier noted that he was “born into a family that required, expected, only the best behavior, only the best principles and values that a person should live by. “I’m not going to say that I carry that out every moment of my life, but that was the environment in which I grew up in," he said in his Emory Medal video. His principles served him well during his employment with Emory University in several roles following graduation. “Through all of that I developed this extraordinary understanding of the university and knowing the people broadly across the institution,” he recalled. McTier is an emeritus trustee of Emory. He is a director of Coca-Cola Fomento Económico Mexicano, S.A.B. de C.V (FEMSA) and the CDC Foundation. McTier also is a trustee of the Pediatric Center of Georgia, the Georgia Research Alliance and the Task Force for Global Health. He is a past director of AGL Resources and SunTrust Bank, Atlanta, and a past president of The Commerce Club. As a member of the Emory Board of Trustees, McTier served on the executive, academic affairs and public policy committees, and continues to serve as a member of the University’s Robert W. Woodruff Health Sciences Center Board. McTier is past president of the Robert W. Woodruff Foundation, Joseph B. Whitehead Foundation, Lettie Pate Evans Foundation, Lettie Pate Whitehead Foundation and Ichauway, Inc. He led the foundations as they played active roles in many of Atlanta's major civic initiatives, including the creation of Centennial Olympic Park and the Chattahoochee River Greenway, the establishment of The Joseph W. Jones Ecological Research Center at Ichauway, and advancements at the Woodruff Arts Center, Central Atlanta Progress and the Georgia Research Alliance. McTier remains humble about his achievements. “If there’s anything good I’ve done it’s because of the expectations that those backgrounds expected of me," he said. Emory Medal recipients are recognized for their service to the university, to the Emory Alumni Association, or to a constituent alumni association; service to the community; and achievement in business, the arts, the professions, government or education. Two hundred Emory alumni and friends have been awarded the Emory Medal.